Having been inspired by screen heroes from the 1940s, 50 and 60s, Oakley's Holbrook Sunglasses let you act out your own life that's full of adventure and exploration. 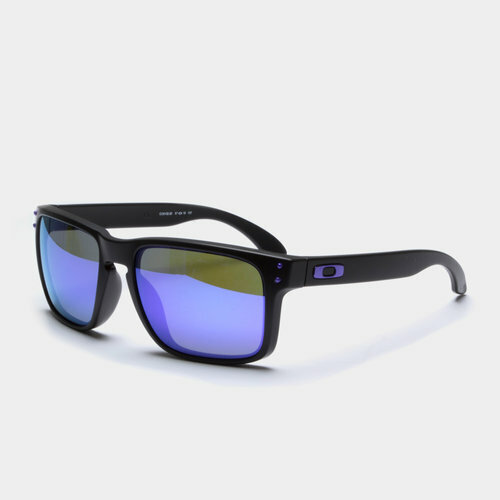 Offering a timeless, classic look fused with modern Oakley technology, the O-Matter stress-resistant frame material is both lightweight and durable so you can be assured of all-day comfort wherever you slip them on. Protecting your eyes, Oakley pride themselves on the pure Plutonite lenses which filter out 100% of all UVA, UVB, UVC and harmful blue light up to 400nm. With patented High Definition Optics (HDO) also on show, these provide superior optical clarity and razor-sharp vision at every angle. Presented with a matte black look, metal icon accents sit inside the frame and the sunglasses come complete with a storage bag which doubles up as a lens cleaning cloth. Get the look and and choose from a range of styles and colours from our Oakley sunglasses collection.